Girl Kuripot Girl Kuripot: Megaworld Lifestyle Malls, Win Flights for 2 to Maldives! Megaworld Lifestyle Malls, Win Flights for 2 to Maldives! This is a chance to fly to Maldives via Qatar Airways courtesy of Megaworld Lifestyle Malls - Eastwood, Burgos Circle, Forbes Town Center, Lucky Chinatown Mall, Newport Mall and Venice Piazza! For every P2000 single-receipt purchase in Eastwood Mall and Newport Mall, you get one raffle stub at redemption booths in the Lifestyle Malls. For every P2000 single or accumulated receipts purchase in Eastwood City Walk 1 & 2, Cyber & Fashion Mall, Eastwood City Food Junction, Burgos Circle, Forbes Town Center, Lucky Chinatown Mall, and Venice Piazza at McKinley Hill, you get two raffle stubs. Bill payments, gym memberships, hotel accomodations, casino purchase, accounts settlements and purchases from temporary exhibitors are not included. The promo period is from April 1, 2012 to May 31, 2012. The deadline for submission of raffle coupons is on May 31, 2012 mall closing hours. The winner will receive two economy tickets to Maldives! The route to get to Maldives is MNL-DOHA-MLE-DOHA-MNL if you want to go there too. 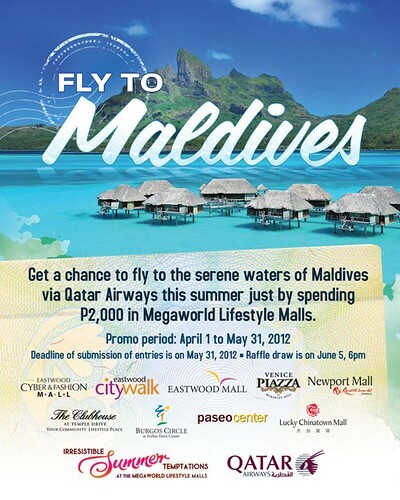 Click here for more info on the Megaworld Lifestyle Malls Fly to Maldives Promo.